In the Blauplat Group we are very proud to collaborate in the social improvement through the ways at our hands. We believe that part of our responsibility to participate and cooperate in actions that may lead to the employment of people at risk of exclusion. They are small gestures, such as the acquisition each year of the details of San Jordi to Aprodisa, entity of protection to disabled, or larger gestures, such as continuous collaboration that for years made the Blauplat Group and Ared Foundation to provide opportunities to working people with more difficulties in accessing the labor market. For this reason, it is a pleasure to work with organizations like the Foundation Ared- Salta to facilitate reemployment both socially and contribute our grain of sand to build a better society. 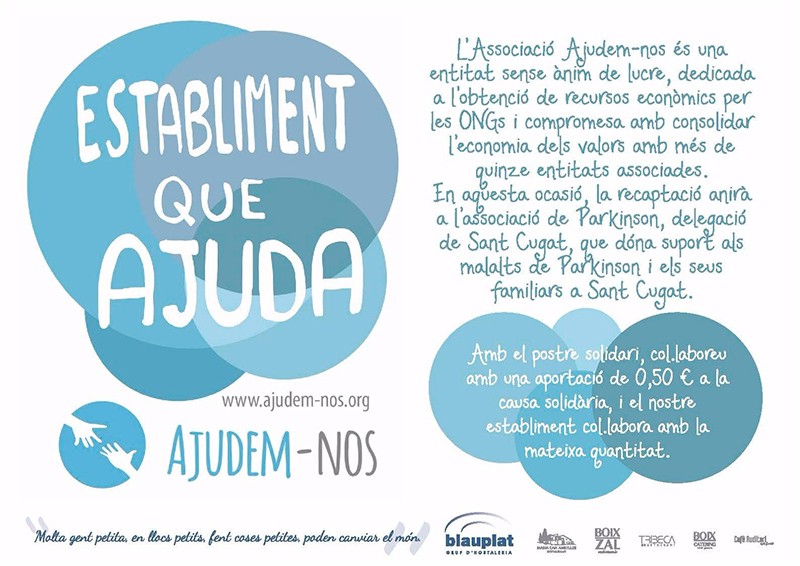 Recently, Blauplat Group has launched a new voluntary collaboration with the association Ajudem-nos, an organization dedicated to obtaining funds to NGOs with over 15 associates. We are totally committed to the values it defendsAjudem-nos, that is why we have promoted a “dessert solidarity” or “pintxo solidarity,” according to the site.